Before users can start working with your Developer Services portal, they need to be added to the system. By default, any user can register on the developer portal by selecting the Register link in the portal menu. The user's account is then automatically authenticated and they are assigned to the authenticated user role. You can customize your developer portal such that only users with admin privilege can add user accounts. In that case, an administrator needs to add user accounts manually. An administrator might also need to add user accounts manually for internal developers or to add developers on behalf of a customer. After a user account is added, an administrator can assign a role to the user account, which associates the privileges for that role to the account. In addition, an administrator can manage an existing user account, including editing the user profile for the account, deleting the account, blocking or unblocking the account, or assigning a new role to the account. An administrator can also specify what happens to the user account and its associated content (for example, blog entries and forum posts) when the account is canceled. The developer portal can automatically send emails to users when events occur. For example, the portal can send an email when a user is added, an account is blocked, or an account is canceled. As part of managing users, you can control the content and format of these emails. See Configuring email for more. To learn how to manage registration workflows; customize registration emails; block IP addresses from registering; and create, manage, and block user accounts, watch this video. By default, any user can create an account from the developer portal by clicking on the Register link. Administrators only: Only administrators can register user accounts. Visitors: Anyone can register. This is the default. Visitors, but administrator approval is required: Anyone can register, but an administrator needs to authorize the account. Select or clear the checkbox for Require e-mail verification when a visitor creates an account. When unchecked, the developer is immediately logged in to the portal after registering. When checked, the user receives an email that they use to validate their email address before they can log in. Depending on your portal configuration, administrators must add users manually, or users can add themselves by selecting the Register link on the developer portal. Note: You can add developers by using the Apigee Edge management UI, the same UI that you use to create API proxies and API products. However, that process is not recommended when using a portal. See Communicating between the portal and Edge and Managing app developers for more. Select People > Add User in the Drupal administration menu. Enter content for the user in the First Name, Last Name, Username, Email address, and Password fields, and indicate acceptance of the user agreement. Optionally set the Status and Roles for the user. Select Notify user of new account to generate an automated email sent to the user. The user selects Register on the developer portal home page. The user enters the required information and selects Create new account. Depending on the new account registration settings, when the new account is created, the user is sent an automated welcome email. By default, when a new user registers on the portal, they receive an email. For more, see Configuring email. However, portal administrators are not notified by default when a new user registers. For example, if you configure the portal so that new users need administrative approval to activate their account, you want to ensure that administrators are notified when the new account is created. Otherwise, the user account remains inactive. Select Configuration > People > Admin Notification in the Drupal administration menu. Send to a specific role. If you choose this option, you might want to create a new role. Otherwise, if you choose a role such as Administrator, then all administrators receive the email and it might not be applicable to all administrators. Edit the message subject and body. Receive Email upon user creation. Receive Email upon user creation and update. Administrators can manage user accounts to set user information, reset passwords, activate accounts, cancel or suspend accounts, and to perform other tasks. Use the filter area at the top of the page to filter the display of users based on a specific username, email address, status, or permission. By default, "any" is selected for these filters, in which case, all users are listed on the page. Click Edit in the Username row for the user account. This opens an editable view of the user's profile. Change the user profile data as appropriate. You can add a CAPTCHA challenge to the login page and other pages by enabling the Drupal CAPTCHA and reCAPTCHA modules. The reCAPTCHA module adds support for the free Google reCAPTCHA service. Drupal supports other CAPTCHA modules, such as image CAPTCHA, that you can also use on the portal. Video: Watch a short video about enabling CAPTCHA in the developer portal. Select Modules from the Drupal menu. Enable both the CAPTCHA and reCAPTCHA modules. Register for reCAPTCHA keys from Google at https://www.google.com/recaptcha/intro/index.html. Select Configuration > People > CAPTCHA > reCAPTCHA in the Drupal menu. Enter the Public Key (Google Site Key) and Private Key (Google Secret key). You can leave the rest of the settings with the default values. Select Configuration > People > CAPTCHA to set where you want the reCAPTCHA form to be presented. By default, it appears on the login and user registration forms. From that page, set the Challenge Type for each form. Select Configuration > User interface > Bootstrap Modal forms from the Drupal menu. Under Register Form Settings, deselect Enable for the Registration Form. You can add a Terms & Conditions page to the developer portal that users must accept when they log in before they are allowed to access the portal. If you later change the Terms & Conditions page, users will be required to accept the updated terms and conditions the next time that they log in. The implementation of the Terms & Conditions page uses the Drupal Legal module. That module provides a flexible way to create a Terms & Conditions page, tracks revision history of the terms and conditions, and tracks users who have accepted the terms and conditions. Once created, the Terms & Conditions page has the URL <siteURL>/legal. Scroll down the page and select the checkbox next to the Legal module. Select Configuration > People > Legal in the Drupal administration menu. This menu item appears only when the Legal module is enabled. The top box on the page, under Most Recent Version/Revision, displays the current terms and conditions. If have not defined terms and conditions, this area is balnk. You create a new version in the Terms & Conditions area under Create New Version/Translation. Enter your terms of service in the Terms & Conditions area. Choose how you want to display the terms and conditions on the page: Scroll Box, Scroll Box (CSS), HTML Text, or Page Link. Optionally add additional checkboxes and a text area describing your latest changes. Select Preview to preview your terms and conditions in the Terms and Conditions of Use area under Most Recent Version/Revision, or Save to save them. Select the T&C History tab to see the revision history of the terms and conditions. Select the Accepted tab to see the list of users who have accepted each version of the terms and conditions. By default, when a user logs in to the portal, they are directed to a page that displays their information, such as first and last name. Alternatively, you can use the Drupal Rules module to add a rule to automatically redirect the user to a different page. For example, you can redirect the user to the page that lists all of their apps or to the portal home page. Before you can create a redirection rule, you must ensure that all the necessary Drupal modules are enabled. Specify the name of the rule: Login redirect. Optionally specify a tag as login. In the React on event dropdown box, select User > User has logged in. The Editing reaction rule page appears. You already set the event in the previous step, so it should say "User has logged" in under Event. Leave Conditions blank for this rule. Select System > Page Redirect in the dropdown. The Add a new action page changes its layout to let you specify the redirect URL. [account:uid] is a replacement pattern that corresponds to the user's portal ID. To see the full list of replacement patterns, select Replacement patterns under the Value input box. 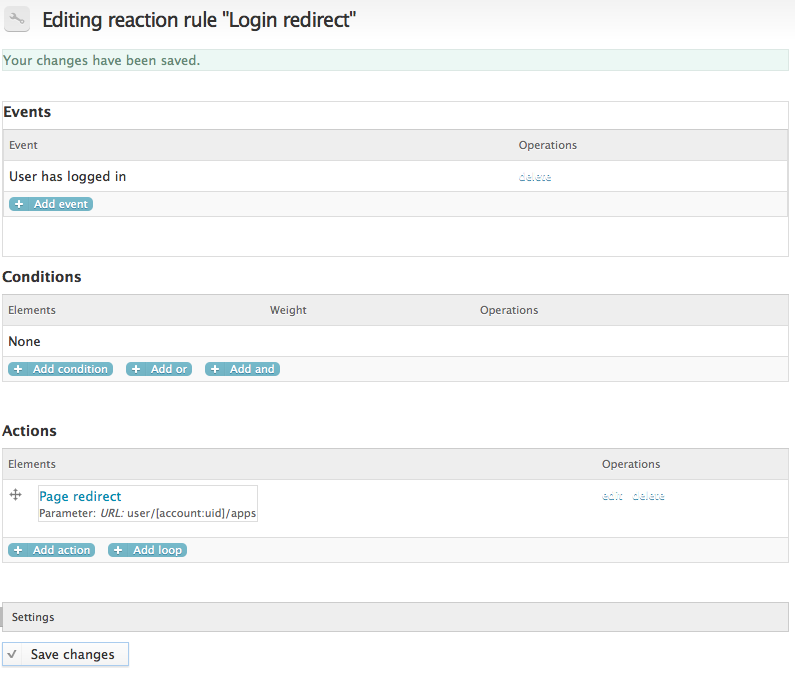 To later edit the rule, select Rules from the Configuration page, and then select Login redirect from the list of rules. Now when a user logs in, they will be redirected to the page that lists all of their apps. If instead you wanted to redirect them to the home page of the portal, edit the Value you set above in step 11 to specify the URL of your portal's home page. For example, http://dev-myCompany.devportal.apigee.io/. A role defines a specific set of permissions that allow a user to perform certain activities. You grant privileges to a user or group of users by assigning the user to a role that has the necessary permissions. Administrators manage roles, including setting permissions for roles, on the developer portal. anonymous user - The role for any user who has not logged in. Anonymous users are prevented from performing most actions. authenticated user - The default role assigned to all users. You can assign a user to additional roles, but they are always assigned to this role. In addition, Apigee has added the role of administrator. Assign users to the administrator role to give them administration rights to the portal. Typically, you add roles to your portal so that you can differentiate permissions based on different user types. A user can be in a single role or in multiple roles. All users are assigned to the authenticated user role, but if you want to assign a user to additional roles you must add logic to your portal or perform the role assignment manually. Select People > Permissions > Roles in the Drupal administration menu. Select People > Permissions > Roles. Enter a new role name in the text box above the Add role button on the People page. Click edit role in the row of the pertinent role on the People page. Change the role name, as appropriate. Select all roles for the user as appropriate. Click the Permission tab on the People page. A table of roles and permissions is displayed. Checkmarks in the table indicate which permissions are assigned to which roles. Check or uncheck a checkbox to grant or revoke the associated permission to that role, respectively. For example, to prevent authenticate users from being able to create or delete apps, scroll down to the DevConnet Developer Apps section of the permissions table and uncheck the boxes for Create Developer Apps and Delete Developer Apps under authenticated users. To learn how to customize the user registration form available from the developer portal, watch this video. 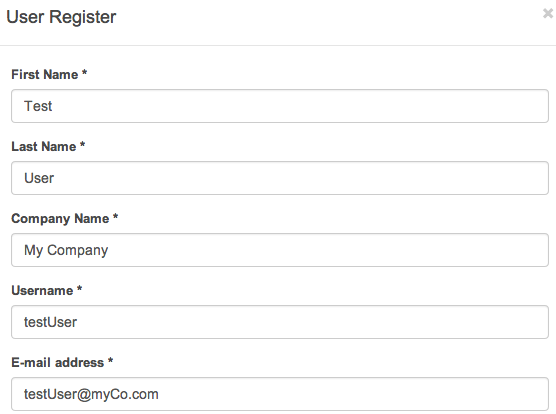 For example, you might add a required field for Company Name, or an optional field for Phone Number. Or, you might add several fields, both optional and required. Selecting People in the Drupal administration menu on the portal. Selecting Edit in the row corresponding to the user's name. This is the primary way that you, as an administrator, access user information. By default, when you add new fields to the form, the field values are not uploaded to Edge. However, you can configure the portal to upload those values when the user submits the form. That means you can view those fields on Edge, or use the Edge management API to access those fields from a script. Note: Because of the way changes to custom fields on Edge are synchronized with the portal, Apigee recommends that you only view custom fields on Edge, but do not modify them. If, as an administrator, you must update user information, select People in the Drupal administration menu and edit the information that way. Select Configuration > People > Account Settings in the Drupal administration menu. Select the Manage fields button at the top of the page. Because this is a text field, you are prompted to specify the maximum length of the field. Enter the maximum length, and the select Save field settings. A check box to set this as a required field. A check box to specify to display the field. Optional help text that appears a popup in the form. Make sure to select the check box to make this a required field. If you make any changes on this page, save your settings. By default, new required fields appear in the form after the Last Name field. Optional fields appear at the bottom of the form, after the password fields. Select the plus, +, symbol under the Label column and drag the field to the location where you want to display it in the form. You can save form field values to custom developer attributes in Edge. You can view and manage custom attributes for a developer as described in Managing app developers. After the custom developer attributes are saved, you can use the Access Entity policy, for example, to enable dynamic behavior based on the custom attribute values. To learn how to save form field values as custom developer attributes, watch this video. Select Configuration > Dev Portal > Developer Attributes in the Drupal administration menu. A list of the available fields is displayed. Select the field that you want to persist as an attribute in Edge, such as Company Name. Set the checkbox for Persist this field as an attribute in Edge. Specify the Edge attribute name. This is the name that appears in the Name column of the Custom Attributes table for the user. Select the Convert value to true|false string if you want to cast the value as a boolean and convert it to a true or false string before sending to Edge. Now the custom attribute will be uploaded to Edge when the user submits the form. If, as an administrator, you want to change the value of a custom field, do it from the portal, not from Edge. You can automatically create a default app when a user registers a new portal account. When the user logs in for the first time, the app appears on their My Apps page. Depending on the permissions assigned to the user's role, you may let the user add additional apps, or this can be the only app available to the user. The way you control the creation of a default app is to create a rule by using the Drupal Rules module. A rule lets you define an action that occurs in response to an event on the portal. In this scenario, the event is a user registering for an account on the portal. The action is to create a default app for the user. The section Customizing the form fields used to register an app describes how to add custom attributes that are used to configure an app. These attributes can be optional or required, depending on how you define them. If you have created any custom app attributes, then you have the ability to set them when defining a default app. Select the +Add new rule button. Specify the Name of the rule. Optionally specify login in the Tags field, or any other tag that you want to use to categorize the rule. In the React on event dropdown box, select User > After saving a new user account. The rule editing page appears. You already set the event in the previous step, so it should say "After saving a new user account" under Event. Leave Conditions blank for this rule. Select Devconnect > Create a developer application in the dropdown. The Add a new action page changes its layout to let you configure the app. Under API Name, specify the name of the default app. For example, use [account:field_last_name] Application. The [account:field_last_name] value is a replacement pattern that corresponds to the user's last name. To see the full list of replacement patterns, select Replacement patterns under the Value input box. Set Developer UID to [account:uid]. This value is required to associate the user with the app. Set the app Status to pending or approved. Set it to pending if an administrator still as to approve the app before the user can use it to access your APIs. If required, set the Callback URL for the app. This field only appears if you configured apps to require a callback URL. For more information on configuring callback URLs, see Configuring callback URL handling. If you defined any custom app attributes, either optional or required, set them. For more information, see Customizing the form fields used to register an app. Specify the API Products included in the app. The Value text area must list each API product on a separate line, with no commas or other delimiters. The list of available API products is shown above the Value text area. Click Save to return to the Editing rule page. To later edit the rule, select Configuration > Workflow > Rules in the Drupal administration menu, and then select the rule from the list of rules. When a new user logs in to the portal for the first time and selects the My Apps link in the menu, they now see an app named lastName Application, where lastName is the last name used when the user registered the account. As a portal administrator, you can use the Developer Apps report to manage user apps directly from the portal. From that report, an administrator can view information about a user's app, modify the app, or delete the app. For example, a portal administrator can modify the app to add or remove API products, change the callback URL, or make other changes. Note: An administrator can also manage user apps by using the Edge management UI. See Register apps and manage API keys for more. Select Reports > Developer Apps in the Drupal administration menu. A sortable list of user apps appears. Select the Edit link to edit the app properties. Select the Delete link to delete the app. A portal administrator can cancel a user account. The admin can cancel an individual account, or can cancel multiple accounts in bulk. Note: If the user has created any documentation, which includes comments and forum posts, Apigee recommends that you select the option to "Disable the account and keep its content" or "Delete the account, but make its content belong to the Anonymous user" when deleting the account. Under the Operations column of the table of users, select Cancel account. Disable the account and keep its content: (Default) The user account and its related content are retained. However, the user account is blocked from accessing API resources. This is the default. An administrator can subsequently unblock the user account. Disable the account and unpublish its content: The user account is retained. However, content associated with the user account is removed. The user account is blocked from accessing API resources. An administrator can subsequently unblock the user account. Delete the account, but make its content belong to the Anonymous user: The user account is deleted. Content associated with the user account is retained, but is associated with the "Anonymous" user account, that is, an account that has not authenticated. The user account cannot be reenabled. The user needs to reregister and the user's account needs to be authenticated before accessing API resources. Delete the account and its content: The user account and its related content are deleted. The user account cannot be reenabled. The user needs to reregister and the user's account needs to be authenticated before accessing API resources. If you want the user to receive an email asking them to confirm the cancellation, select "Require e-mail confirmation to cancel account". If you select this option, the user's account must have the correct permissions to allow the cancellation. Select People > Permissions and ensure that the "authenticated user" role has the "Cancel own user account" permission set. Under Operations, select Cancel user account in the dropdown. Select the checkbox next to each user whose account you want to cancel. Disable the account and keep its content. Delete the account, but make its content belong to the Anonymous user. Delete the account and its content. Administrators of the developer portal can set the default action of the portal when a user account is canceled. Select Configuration in the Drupal administration menu.